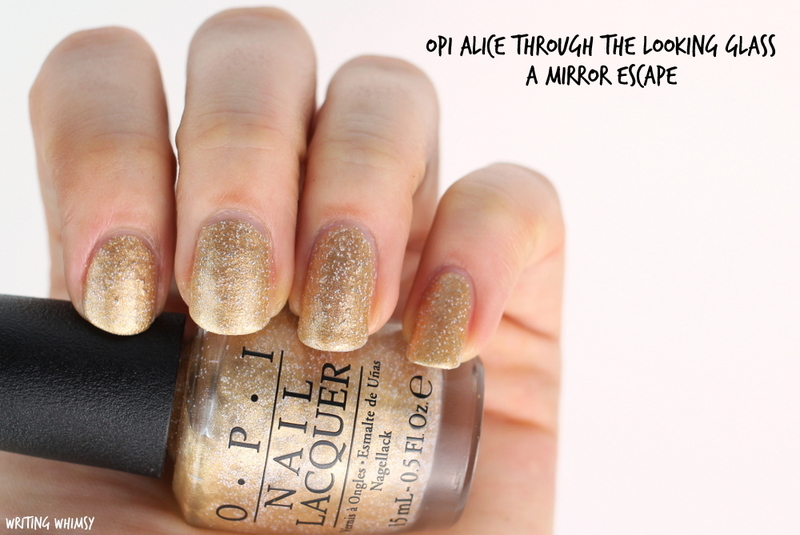 OPI A Mirror Escape is a yellow gold metallic with silver glitter. It dries to a textured finish which honestly looks a bit lumpy to me. It’s a strange shade for a summer collection, but I don’t hate it. It’s nearly opaque with 2 coats, but I went with 3. OPI Fearlessly Alice is a bold cerulean blue creme polish. I always seem to the love the OPI blues the best, and this is no exception. Can I ever have too many? NOPE! I used two coats and while I liked the formula, I did get a bit of staining from it even through a base coat, so be warned. 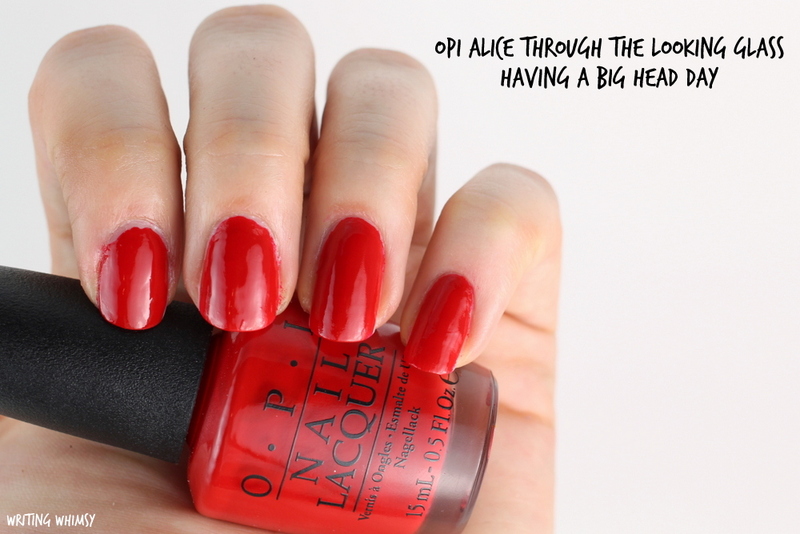 OPI Having a Big Head Day is a classic red creme polish. This polish is super glossy but a bit thin, I found that it could flood the cuticles a little if I wasn’t careful. I used two coats for an opaque finish. OPI I’m Gown For Anything is a pale lilac creme polish which is the kind of shade I really do love for Spring and Summer. After one coat this was a little streaky still pretty opaque, and with two it looks really good and I’m quite impressed with the formula for a lilac! Like I said, I really love shades like this and this has one of the better formulas I’ve tried. 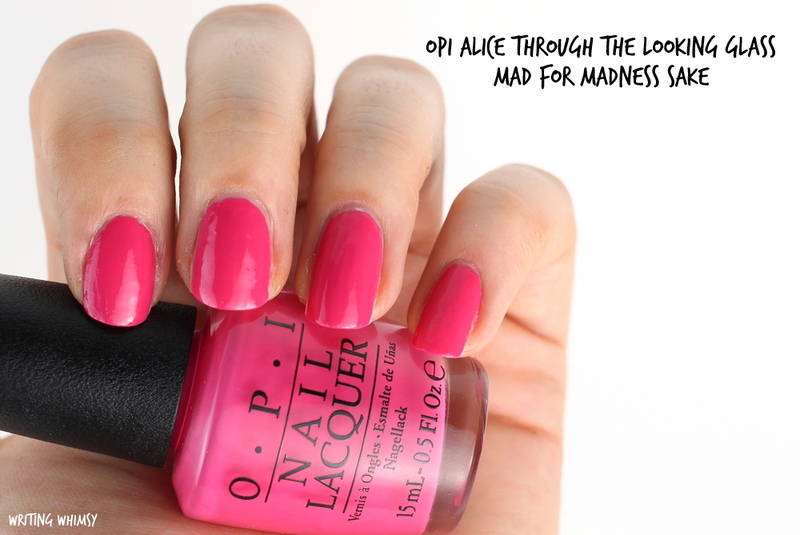 OPI Mad for Madness Sake is a bright fuchsia pink creme polish with a gorgeous formula and coverage, although not the most unique. I needed 2 coats and it really was nice to apply, so if you don’t have a shade like this, I do recommend! OPI Oh! My Majesty is a gorgeous mother of pearl with an opalescent sheen to it. It looks really pretty but applies a bit unevenly and so although I went with 2 coats, I definitely recommend a third (#regrets). OPI The I’s Have It is a light powder blue creme. I really do love my blues and this one is super pretty, although it is a tiny bit streaky. I used two coats to even it out. OPI What Time Isn’t It? 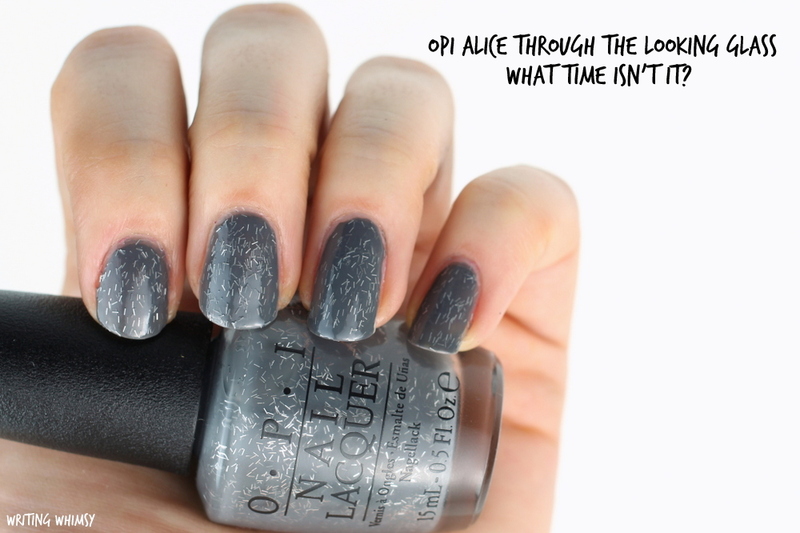 is the special edition shade from the OPI Alice Through The Looking Glass Collection. This is a dark grey creme with short silver bar glitter. I always hate bar glitter, but the shorter ones don’t bother me as much and it ends up with a fairly smooth finish, especially if you were to add a top coat (I swatch without). It’s opaque in 2 coats, and while it’s sorta strange, it’s also the most unique in the collection if you are looking for something different. 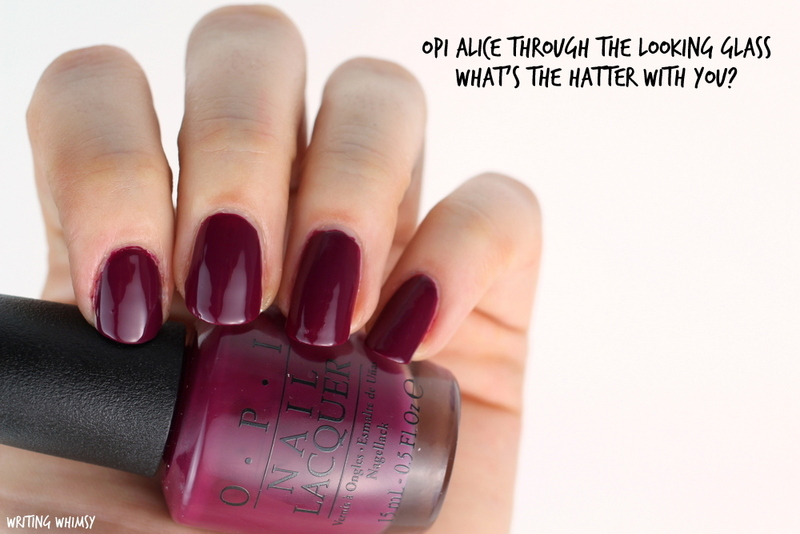 OPI What’s the Hatter With You? is a dark burgundy plum creme polish. I love this shade, although more of a Fall colour for me. Unfortunately the formula is a bit sheer and runny, so it’s opaque with 2 thicker coats but I ended up having to use 3 on one nail. It’s also super shiny! And that’s it for the OPI Alice Through The Looking Glass Collection! I love OPI creme polishes so I really enjoyed this collection, but with such a whimsical inspiration I was surprised not to see a few more unique shades. If you’re looking for a really cool but strange polish, I definitely recommend What Time Isn’t It? In terms of gorgeous cremes, my Summer picks are the gorgeous blues The I’s Have It and Fearlessly Alice as well as the lovely lilac Gown for Anything. 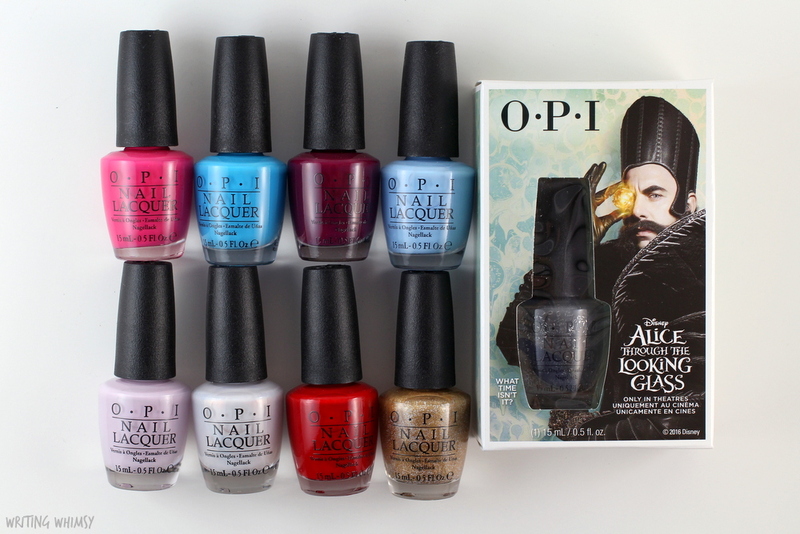 Do you have a favourite from the OPI Alice Through The Looking Glass Collection? Let me know what it is!